Inspirations: The streets of my favourite cities in the world where I have lived; Tokyo, New York, Melbourne and now Sydney. Favourite thing about Sydney: As a new resident I am loving the weather (coming from Melbourne). More so I’m loving the enthusiasm and positivity of everyone I encounter in the fashion industry in Sydney. 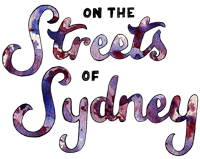 It seems the city oozes style and creativity and I am looking forward to discovering more thanks to On The Streets Of Sydney.com. Dream Fashion Team to work with: I am really excited by the team I have assembled for On The Streets Of Sydney.com. They are all so talented and passionate about fashion and this great city. Inspirations: Romance, winter, play, Dali, history, Shakespeare, Simon & Garfunkel, vintage photography, the idea of “home”, France, nostalgia, and did I mention romance? Favourite thing about Sydney: The natural aspects - Sydney is a city of lush green parks and glorious beaches. You never need to stray far to feel like you’ve taken a holiday. Favourite Model: So many models intrigue me, but right now I’m really loving Ashley Smith. Inspirations: I get inspired by everything around me: celebrities inspire me particularly the Olsen twins, fellow fashion bloggers and everyday street style as well as architecture, music and culture around us. I am also inspired by Lady Gaga who makes fashion fun and isn’t afraid to take risks. I suppose who isn’t inspired by her or her music? If you could have any animal as a pet what would you have? It would definitely be a toss up between a triceratops and a wild cat, perhaps a lion cub or a leopard. Favourite thing about Sydney: I love everything about Sydney - the delicious and exquisite food culture, unbelievably exciting fashion in Sydney (a hybrid laid back mixed with high street glamor), the amazing wildlife, the art scene and lastly Sydney Harbour, which I get the pleasure of enjoying almost everyday. Sydney is a great place to live!! Inspirations: Sophie Delaporte first and foremost for her use of light and colour and other photographers like Terry Richardson and Ellen von Unswerth for their balls and cheek. Books like One Hundred Years of Solitude by Gabriel García Márquez and lyrics from songs by Neutral Milk Hotel and The Decemberists. Favourite thing about Sydney: The spectacular weather, the breathtaking beaches and the carefree spirit. Inspirations: Oh, I take inspiration from the wonderful, magical world around me, nature, art, beauty… Just kidding, mostly European fashion magazines like Tush and Italian Vogue, faces like Alice Kastrup-Moller, Lara Stone, Guinevere Van Seenus and Daphne Groeneveld and from makeup artists like Alice Ghendrih plus any makeup artist on the books of the agency Ballsaal. Favourite thing about Sydney: I’ve only been living here for a couple of months, but I think so far it’s my little pocket of the city, Elizabeth Bay. Tree lined streets and beautiful parks by the water. Best beauty tip: For me, beauty starts and ends with skin. Achieve beautiful skin and everything else will fall into place. Do some research, try out different products for your skin type and most of all, be consistent and thorough. For an instant fix, gently buff your skin for a couple of minutes with a wash cloth and warm water and rub in some moisturiser. Inspirations: Anyone who marches to their own beat; candid photography; travel; outside cultures; laughter; 1900 - 1999′s fashion… Since then we’re borrowing from our history. Red lips; old hollywood glamour; menswear on women; Sienna Miller; Edie Sedgwick; Chloe Sevigny; Marc Jacobs; Alexander Wang; Alexander McQueen (rip); The Olsens; Taylor Tomasi-Hill… The list goes on and on. Favorite Thing About Sydney: The new adventures it’s bringing me & how different it is from home in America. If you had to wear one thing for the rest of your life, what would it be? Long skirts, booties, sheer anything, silk, wide brimmed hats, huge carry-alls… layers, layers, layers. Also, animal prints, sequins, & vintage suede, leather, & fur - Sorry animal activists. Inspirations: Creatives with the courage to march to the beat of their own drum: the Surrealists, Jil and Miuccia in the 80s, the Haus of Gaga… And in terms of aesthetics, I am fascinated by fashion reductionism: can minimalism ever be enough? Favourite Thing about Sydney: The speed of life. I’ve always been a bit of a nana driver, and I’m happy doing 65 in an 80 zone, sunroof open, listening to The Smiths. While New York is disqualified for speeding, Paris for driving through a red light, and Tokyo for not using the hands-free, Sydney stays at 65 and comes through for the win! Fashion Guilty Pleasure: Thongs …as in Havaianas. I guess technically not a pleasure, as I actually can’t stand them. With shorts, with jeans; at work, at the beach. OK, maybe I can handle them at the beach. But when summer rolls around, and I’m rushing out the door, I always find myself giving in to the allure of the Y-shaped strap! As in flip flops, people. Inspirations: I’ve always been inspired by Gwen Stefani, I love how she has always stuck to her personal style & has never changed it because of other people’s opinions or criticisms. I also love looking at make-up trends, I especially love M Magazine - The Make-Up Store’s beauty publication that you can download for free online because it has great photos of heaps of different styles. Favourite thing about Sydney: I’ve lived in Sydney my whole life so as much of a boring answer as this is I’d really have to say that I love the familiarity of it most. Who is your favourite designer and why? I don’t particularly have a so called ‘favourite.’ I enjoy innovative designers that make clothes that you can actually wear and I really like pieces that can be worn in the day and also dressed up at night. If I did have to name a few favourites off the top of my head I would probably say Shakuhachi , Lonely Hearts & Birthday Suit. Inspirations: Cold weather, Sofia Coppola films, children’s books, Celine by Phoebe Philo, French pop music, Jane Birkin, The Gentlewoman magazine, the colours burnt orange and dark purple, spices, fashion blogs, rolled up sleeves and cuffed pants, oceans, long train rides, minimalism, the writing voice of Sophie Dahl and A.S Byatt and the fashion journalists Sally Singer, Harriet Quick and Rebecca Lowthorpe. Favourite thing about Sydney: The thing I love most about Sydney is that happy-go-lucky, laid-back thing we have going on. We don’t take ourselves too seriously, even when we think we do. We always poke out our tongues, or wear something a little bit tacky just because we like it, or blast good times tunes DMX’s Party up in Here. Nothing is ever boring. All we want to do is have some fun. Who is your style icon? The person who has the most influence over my style is the wonderful Phoebe Philo. I remember craving just that little bit of her Chloe world – the baby blue cut out dresses billowing out from Gemma Ward or Sienna Miller way back in 2004. And now I seem to have grown with her. The peasant smock tops and gypsy skirts are no longer a staple of my wardrobe. They are instead replaced by all those classic, minimalist pieces she champions both at Celine and in her own wardrobe like pleat-front pants, the perfect silk button-down and sleeveless trench coats. The simple, no nonsense way that she approaches style is the most resonant, most enduring message I have become attached to in these recent fashion times. It is a message that I simply cannot get out of my head. Inspirations: My fashion inspirations come from anywhere - from fashion blogs to fictional characters like Carrie Bradshaw for SATC. Favourite Thing About Sydney: The amount of the same fashion chain stores all located within one metre distance from the other. Just take a look at Nine West, there’s on Pitt Street, the new Sydney Westfields, World Square, Metcentre and DJs Elizabeth Street. Same with Witchery, Cue and Diva. Do you prefer Spring/Summer or Autumn/Winter and why? That’s a tough one. I like Spring/Summer because I can go to the beach, while I like Autumn/Winter because of the fashion. I’m a sucker for paddington coats and great boots. Wow, it’s great to meet you all. I can’t wait to see what the team comes up with! This site is amazing! so professional! Great work sis! Congrats on the awesome site guys!! Cannot wait to see the amazing things you’ll undoubtedly have in store for us. Love the layout, esp the water colour splash background. Hannah you are gorgeous!! and all you girls… congrats on the site going live, it’s awesome. well done Hayley! I’m loving everything about this site! You’ve pulled it off so well guys, and it was lovely to be introduced. It’s so aesthetically pleasing - the front page looks great! - and I’m going to go and read all the articles/see all the pictures after I post this, really digging the feel of it all.